“I dare say this is the biggest fair in Brazil when it comes to diversity,” João Paulo Rodrigues, a director of the Landless Workers’ Movement (Movimento dos Trabalhadores Rurais Sem Terra – MST) said about the third edition of the movement’s National Agrarian Reform Fair. The event will take place between this Thursday (3) and Sunday (6) at the Água Branca Park, in the West Area of São Paulo. 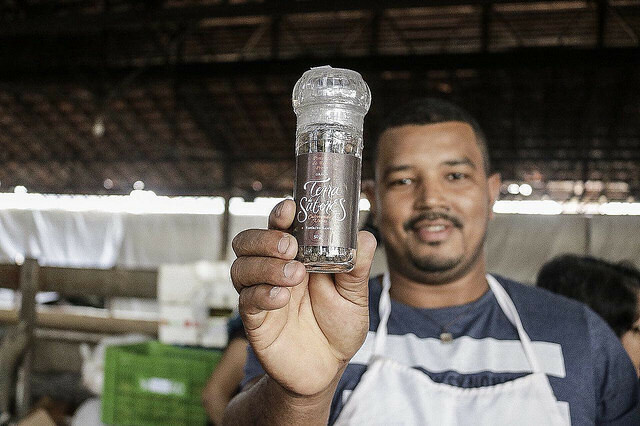 More than 1,200 items produced in 23 Brazilian states and the Federal District where the MST is organized will be sold at the fair. “If it were a fair organized by large-scale agribusiness, I doubt there would be more than five products: soy, sugarcane, pulp, cattle… Not to mention the sheer quantity [of products at the MST fair] – 330 tons of agrarian reform products is a number that speaks for itself,” Rodrigues told the press during the opening of the fair. The MST coordinator said the festival is taking place while the country is witnessing a serious political crisis and a growing wave of hatred. For this reason, the strategy is to deconstruct the negative idea people have of the movement. “We want to start a conversation with society based on our production. The main role of agrarian reform today is healthy food production. That is a radical change,” he said. Rodrigues pointed out that the fair displays what the MST continues to grow in rural areas, even though the country has stopped its process of land expropriation for land reform. “This is the second year in a row we don’t have a single family settled [on land]. We may possibly have small areas of settlements established this year, in places that had been approved for it two years ago. This is a year we have nothing to celebrate in terms of agrarian reform,” he reported. Rodrigues also mentioned how violence has increased in the countryside in Brazil. According to the religious advocacy group Pastoral Land Commission (Comissão Pastoral da Terra – CPT), killings in land conflicts were up by 105% since 2013. “The fewer families are settled on land, the more people are killed in the countryside,” he claimed. Débora Nunes, who is also a member of the MST coordination, stressed how important the fair is to demystify the movement. “It’s not about changing the image of the movement, but actually bringing society closer to our conversation. It’s important that society sees what the MST’s goals are,” she said. More than just sell products, Nunes also pointed out the cultural and political education aspect of the event. “Our fair shows so many dimensions of the lives and routine of landless workers, so that society can get to know the dynamics of peasants’ lives,” she said. The National Agrarian Reform Fair will have live concerts of great Brazilian musicians, as well as discussions on agroecology and black genocide. There are more than 1.1 million families settled on land in Brazil – 400,000 of them are members of the MST, according to the movement. The organization is active in 1,226 cities and grows around 8 million hectares of crops around the country.